Pinch-hitting for ED Carmen Reyes-Zubiaga, DED Matt Lee Jr., met the 5-man team for this world event on October 29-November 2, 2012 in Incheon, Korea. He helped find the team’s name – “MAKE THE RIGHT REAL – PHILIPPINES, adopting the new Decade’s tagline, with the theme: I.T.’s More Fun in the Philippines”. The young delegates will compete in e-LIFE, e-Tools and e-Sports categories. The 5 delegates are: 1) Ms. Jennifer Garcia, Team Coordinator from NCDA, will also present a country paper on “Accessible ICT in the Philippines”, 2) Ezekiel “EJ” Erpelo, MCCID Institute of Technology, 3) Gerson Peralta, Philippine National School for the Blind (PNSB) , Jabby Vesagas (Independent Living Learning Centre (ILLC), and Jabby’s Mother/Personal Assistant Mrs. Connie Vesagas. Left to right: NCDA-TCD Chief Nelia R. de Jesus, Mr. Pablito Gesmundo (PNSB), MCCID Institute of Technology Training Director/Coach Jojo Esposa, PNSB Teacher/Coach Adonis Untalan, RP Team Coordinator Jennifer Garcia, Youth Delegates Ezekiel John “EJ” Erpelo (MCCID) and Gerson Peralta from PNSB, NCDA-DED Matt Lee, Jr., Youth Delegate Jabby Vesagas (ILLC), Jabby’s Mom/Personal Assistant Mrs. Connie Vesagas, Ms. Nina Almeda, ILLC Coach and Mrs. Peralta. The meeting no doubt, set the whole team on a high gear, with NCDA’s full support. Big thanks goes to the Department of Foreign Affairs’’ staff Ms. Mila Cruz, who tirelessly makes the express lanes for PWD passport applicants real, including these young delegates. 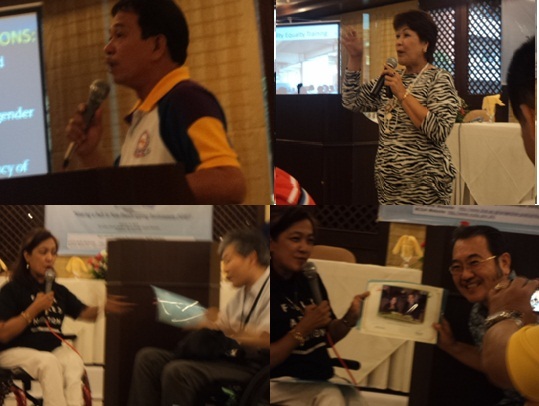 To seal the recently concluded ‘’Philippine Disability Affairs Office (PDAO) Congress”, held in Bayview Plaza Hotel on August 15-17, 2012, PDAO Officers/focal persons signed the Manifesto of Commitment/”e-PDAO Network”, to spur and serve as hub in rolling out national disability programs most effectively. 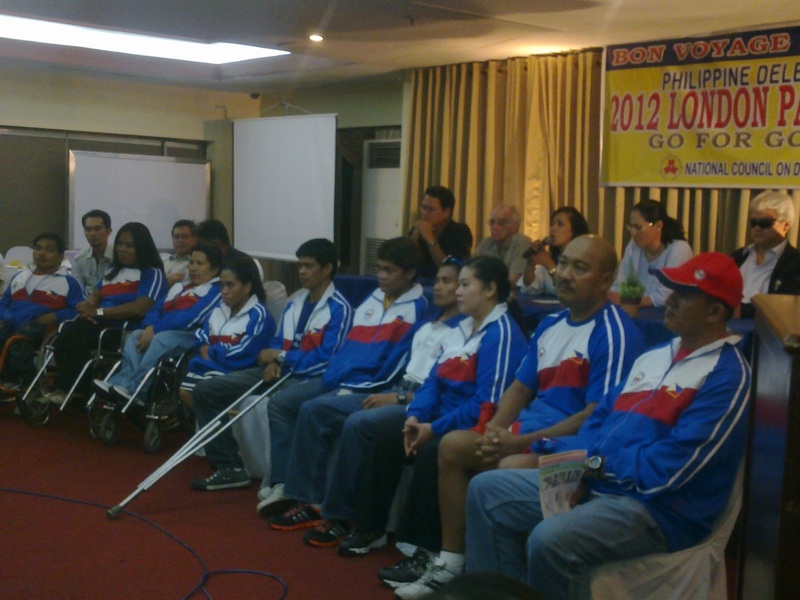 Godspeed, RP Paralympics Team! 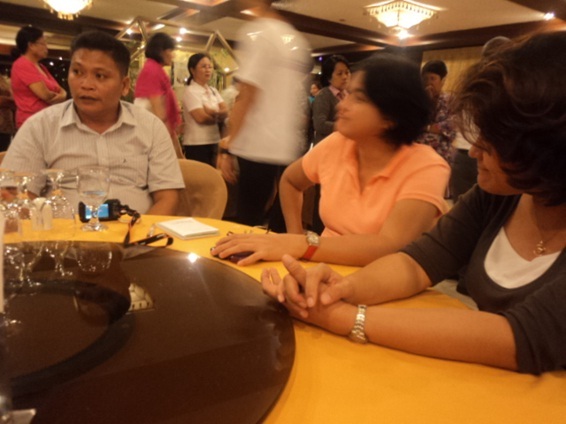 NCDA Executive Director Carmen Reyes-Zubiaga leads well wishers in honoring and cheering the “Go for Gold RP Paralympics Team”in a dinner hosted by the Council at the Bayview Plaza Hotel, last August 17, 2012. This sendoff of the Philippine bets to the “ International Paralympics” in London meaningfully capped the closing of the 3-day 3-day PDAO Congress held in the same hotel. 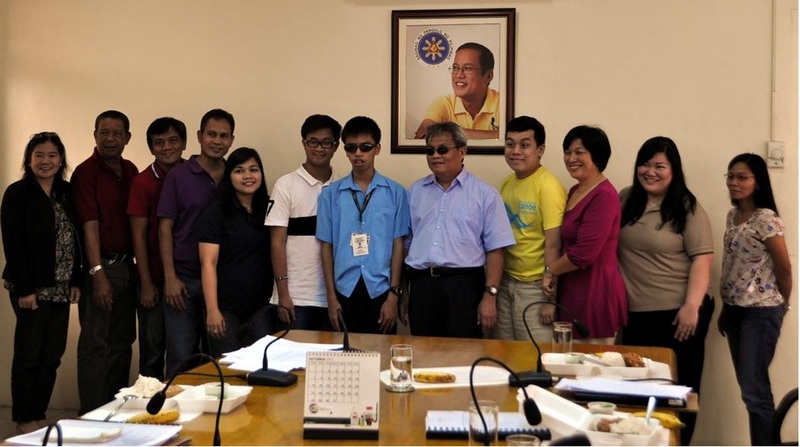 Proud Mayor Dexter Yasay recently awarded Mary Jane Villanueva, Opol Federation of PWDs’ Vice President, as the “Most Outstanding PWD” for 2012. Launched to kick off Opol’s 2012 NDPR Week with a motorcade, this aims to raise awareness on the beauty and potentials of PWDs as productive citizens of Opol. 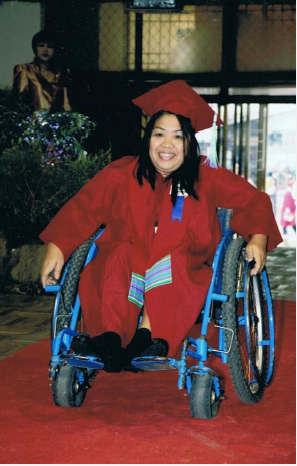 Besting 9 other candidates, Ms. Villanueva is among Opol’s staunch disability advocates, who are highly instrumental in their high impact ‘’Non-handicapping Environment” pilot project, in sync with the Japan International Cooperating Agency (JICA) and the National Council on Disability Affairs. Samahang Kapatiran ng May Kapansanan para sa Hanapbuhay Inc.
Samahang Kapatiran ng May Kapansanan para sa Hanapbuhay Inc. is owned and managed by Arthur Quiroz. 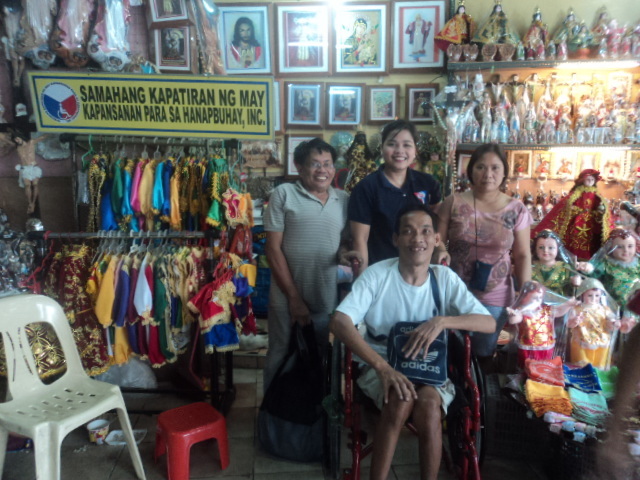 A PWD entrepreneur with orthopedic engaged in selling religious articles in Quiapo, Manila Philippines. CHEDRO 9 is an active member-agency of the Regional Council on Disability Affairs which is mandated as the governments’ focal agency on disability-related concerns at the regional level. As part of its commitment the office regularly attend the quarterly meetings of the RCDA, which is the working body to promote, implement and monitor various programs and projects for the sector. 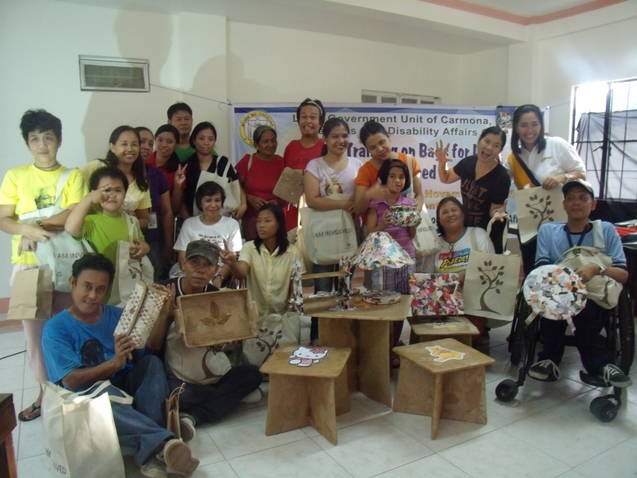 For SY 2011-2012 there are six (6) PWDs scholars of the Commission in region 9 among the many on-going grantees. 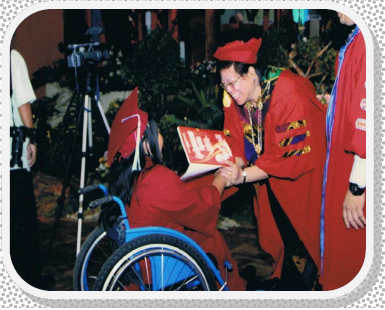 Slots for persons with disabilities for scholarship is a continuing program every year. Some PWD graduates manifested their gratefulness to CHED and even write us letter of gratitude. Yearly, CHEDRO9 is a proud partner in providing social protection, economic development and in helping promote the rights and welfare of the poor, vulnerable and the disadvantaged individuals, families an communities as a whole as we carry on the government programs in the education sector. 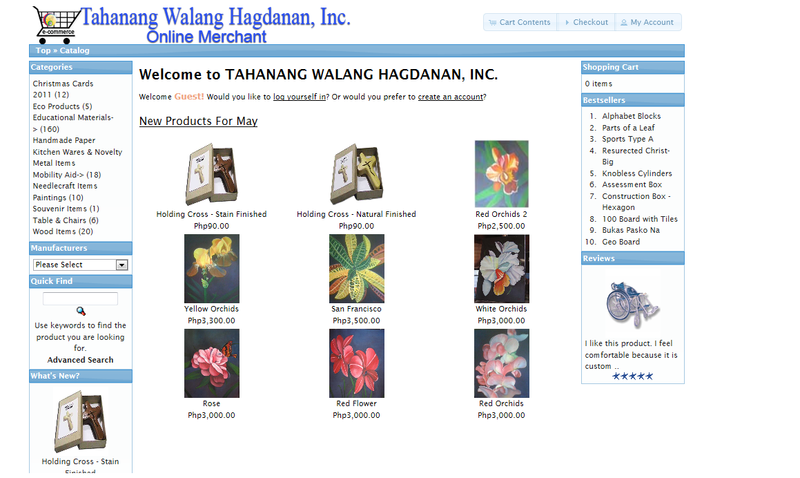 PWD Webstore features Tahanang Walang Hagdanan, Inc. – a non-stock, non-profit and non-government organization that aims to uplift the lives of the Orthopedically handicapped persons. It was founded by Sr. Valeriana Baerts, ICM. a Belgian nun who was assigned as a volunteer nurse here in the Philippines. The center is located in Cainta Rizal which is about 15 kms. East Manila. It has five workshops, six Dormitories for trainees who came from far provinces. It is a rehabilitation and skills training center with sheltered workshops where the people with disabilities are trained to be productive and self-reliant member of the society.